It's a pretty simple sketch, so I kept things pretty clean and simple. The papers are from Lime Twist Life of the Party 6x6 pad by My Mind's Eye. Cardstock is Sour Apple, Wild Cherry, and Sweet Tooth. The woodgrain pattern paper was exactly what I needed for the Die-namics Branch with Leaves. 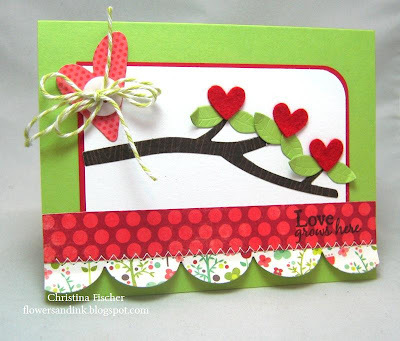 I used Die-namics Notched Tag Die to cut the felt hearts, and the large heart was cut with Die-namics LJD Rustic Hearts. I stamped the sentiment from LJD Homespun Hearts in Black Licorice Premium Dye Ink. I added some Die-namics Simply Scallops and finished with a button and Honeydew Twine. Next on my to-do list is some Valentine decor for the mantel. I'll have pics as soon as it's finished! Thanks for taking the time to visit today. I hope you have a great day! Happy Tuesday, everyone! Yesterday's day off was such a welcome break, and I accomplished much at my house! That pile of laundry is quite a bit smaller, papers are graded and lesson plans finished, and I had some extra time for stamping! 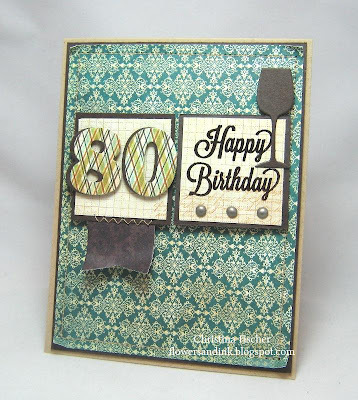 I used this week's Mojo Monday Sketch to make a birthday card for my father-in-law, who turns 80 this week. 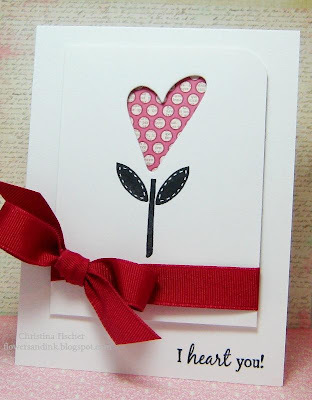 I love this simple sketch by Carole, and I thought it was perfect for a CAS masculine card. The papers are from the Lost and Found Two: Breeze 6x6 pad by My Mind's Eye. 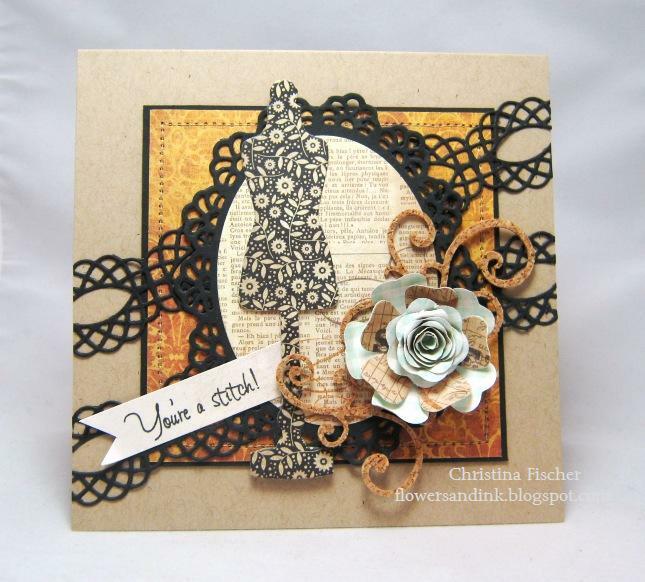 Cardstock is Hot Fudge and Kraft. 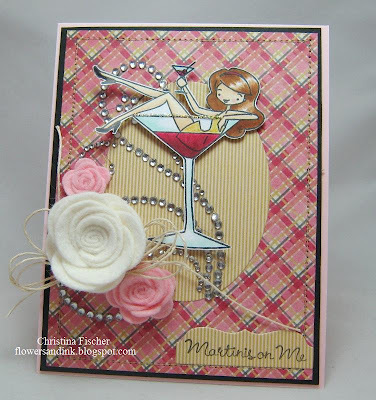 I used three Die-namics on this card: By the Numbers, Mix & Match Banners, and Let's Toast. The sentiment (also from Let's Toast) was stamped in craft ink and heat embossed with clear embossing powder. That's it for today. I hope your week is off to a good start! Thanks for visiting! That's it for today! I'm enjoying the day off today, then it's back to school tomorrow! Thank you so much for taking time to stop by. Have a fantastic day! Hello there! I hope you are having a good weekend so far. It has been a marathon of basketball games for Anna so far this weekend, as her team has advanced in two tournaments. She played one game last night, two today, and we're looking at two more tomorrow! After today's games I spent a little time decompressing with some stamps and Die-namics. I made this card for this week's MFT WSC Sketch. You can find the sketch and all the WSC details HERE. I kept things simple, so I'll just list the supplies I used below. 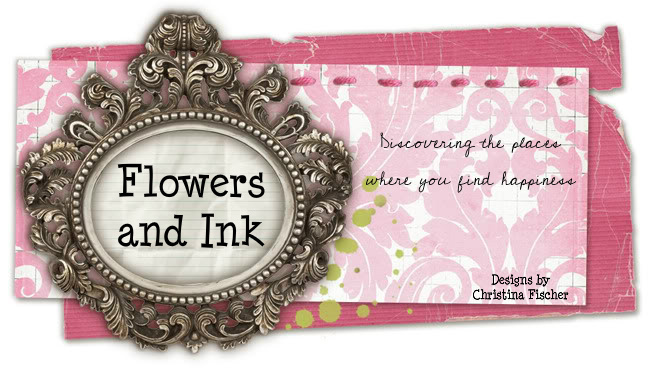 I will tell you that I used MFT's new Premium Dye Ink in Wild Cherry. Let me just say, the coverage is amazing! LOVE! I'm going to go breathe in some of that springlike air before it's gone. I hope you're having a good weekend. Thanks for stopping by! I used papers from A Happy Heart 6x6 pad by My Mind's Eye. The cardstock is Pink Lemonade and Black Licorice. 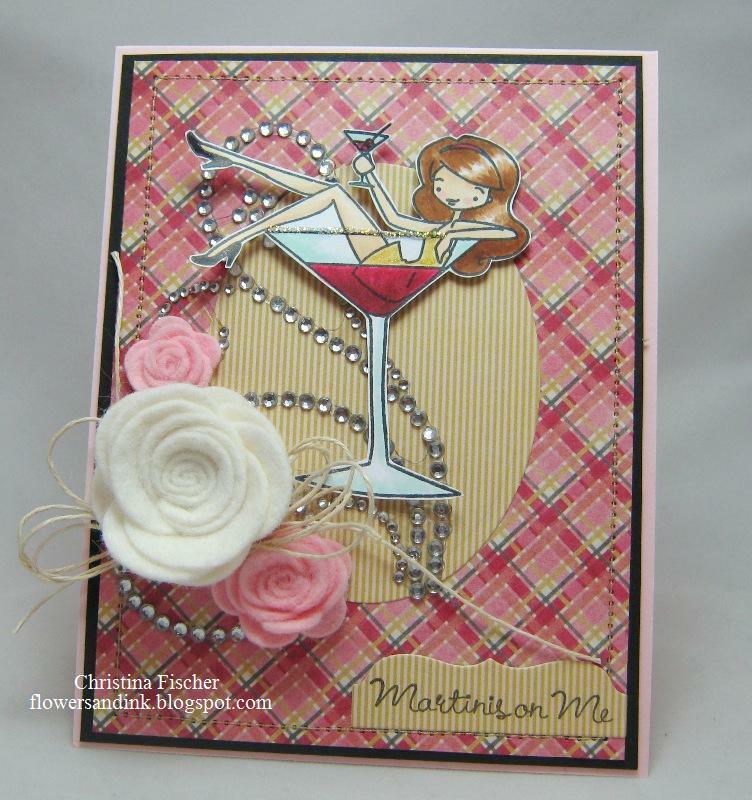 I stamped the image from a la modes Martinis on Me on X-Press It Blending Card and colored with Copics. I created the roses with Die-namics Rolled Rose and Mini Rolled Roses cut from felt. 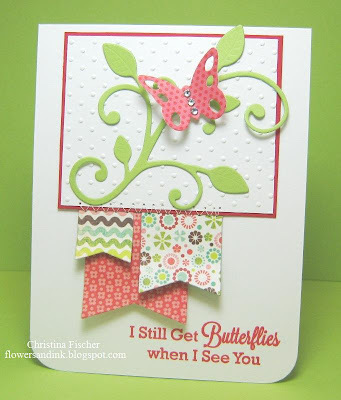 The sentiment is stamped on one of the Die-namics Mini Tabs Foursome. 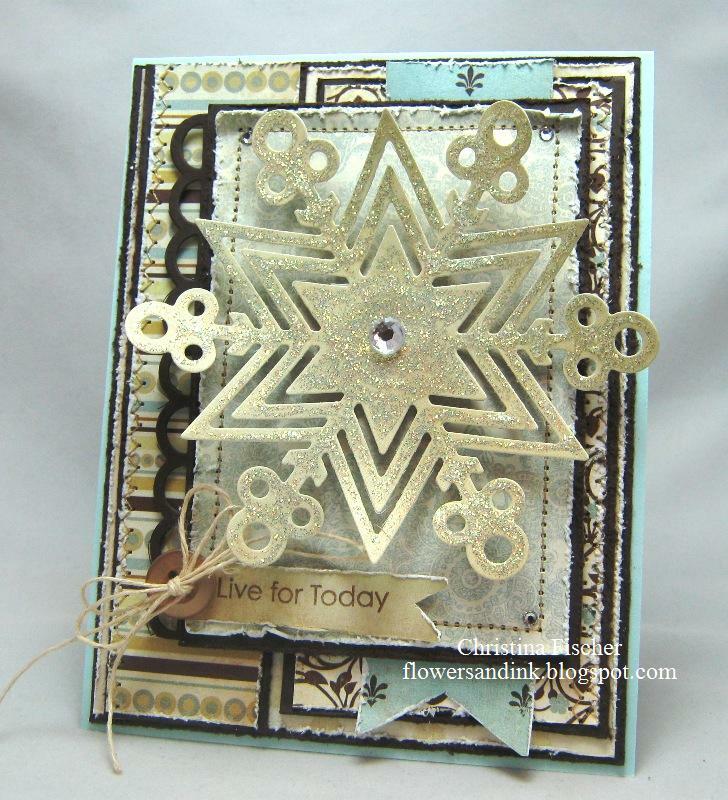 To finish the card, I added a rhinestone flourish and some Hemp Cord. I also added a little sugar rim to my pomtini (my fave!) using Diamond Stickles. Thanks for stopping by -- have a great day! Happy Saturday to you! I'm thankful for a free afternoon, because I was able to create another card for the MFT Guest Designer Contest. It's such a great sketch! 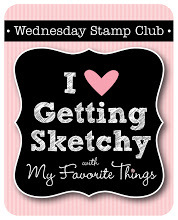 You can get the contest details HERE on the MFT Forum at Splitcoaststampers. 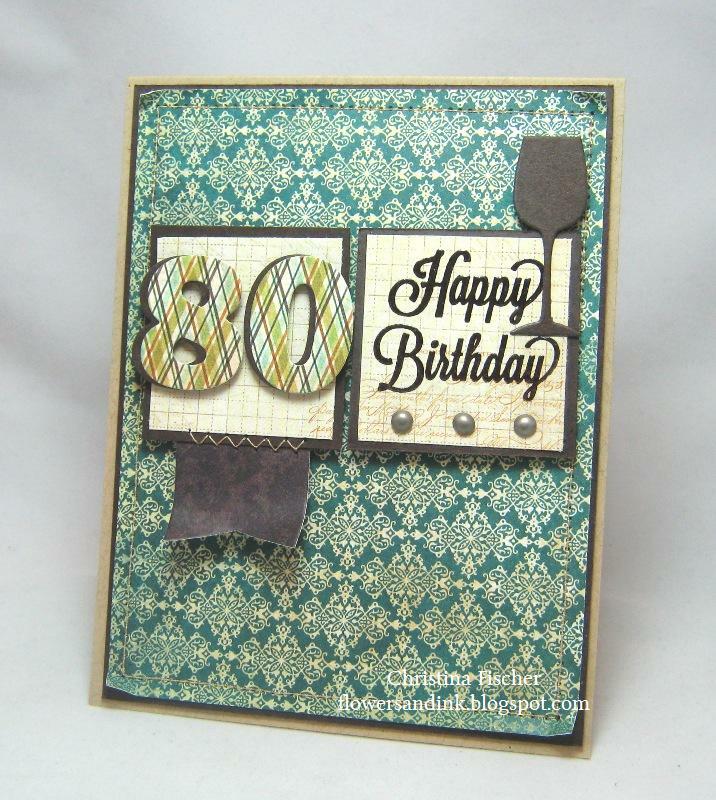 This card is quite a bit different from my first entry -- I went with a distressed look and subtle colors. The papers are from the Paris & Co. 6x6 pad by My Mind's Eye. I paired them with Sno Cone and Hot Fudge cardstock. 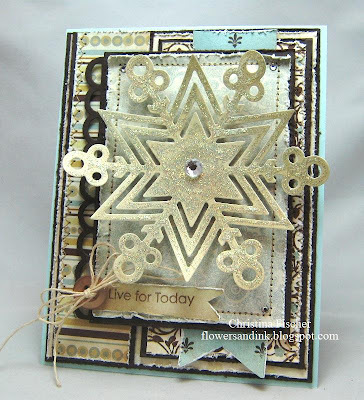 This Die-namics Jumbo Snowflake is beautiful enough on its own, but I gave it a coat of Diamond Stickles to really make it the focal point of this card. The sentiment is from Clearly Sentimental about New Beginnings. I anchored the sentiment with a Kraft Button and some Hemp Cord. There's something I really love about the contrast of the earthy elements with the bling. I hope you all are having a great weekend. Thanks so much for stopping by!